Typically, the first words used in Chinese to describe Pak Mei Kung Fu are noi ga kyun, or internal style of Chinese martial arts. This descriptor conveys the notion that it is a combative form of Kung Fu that relies upon an integrated execution of force - rather than the dependence upon sheer muscular strength and physical prowess, inherent within the system's techniques. In Pak Mei, physically - everything begins with the stance; mentally - everything starts with intent; and, metaphysically - everything originates from the breath. As a result, a distinct set of principles was defined by Master Cheung Lai Chuen and his family members to express the intricacies of this system. Ging (勁) refers to the totality of martial force while lik (力) is typically associated with muscular intensity. In Pak Mei, the term ging is used to emphasize the production, execution, and application of integrated force. Luk ging (六勁), sei noi biu ging (四內標勁), and baat ging (八勁) all incorporate the expression ging within their descriptions to accentuate the relationship that these principles share within the process of issuing force. The physical aspect of producing ging requires that the network of 6 specific areas of the body act in unison. 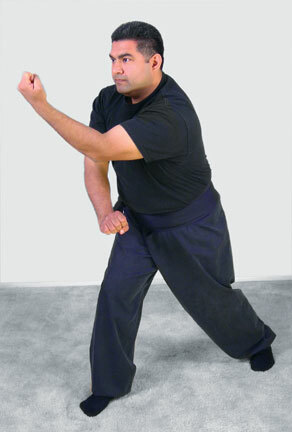 The Pak Mei stance (白眉馬), customarily known as ding bat ding, baat bat baat (丁不丁, 八不八), is the foundation upon which all techniques are derived. The exact translation of this couplet is: not completely in the shape of the Chinese character for person (丁) and not completely in the shape of the character for the number eight (八) - referring to the placement of the feet and width of the legs. This principal position enables the practitioner to execute techniques with both stability and mobility. To ensure proper support, the practitioner's weight is equally distributed between both legs assisting the action of linking the muscles of the core, back, and chest to optimize faat ging (發勁) - the emitting force that drives Pak Mei techniques. Collectively, the waist and the core muscles known as yiu (腰) in conjunction with the back, or bui (背), facilitate the mechanics of the upper body in this martial power circuit. As the actions of the trunk turn and torque, close and open, and compress and expulse in unison, the force generated from these gestures travel to the extremities known as sau (手), literally the hands, to be emitted in an effective and injurious manner. For the practitioner, this same damaging force is kept from causing personal harm to the practitioner when the neck - geng (頸), and the teeth - nga (牙), complete the physiological circuit responsible for the production of faat ging. These final two areas are defined as critical components within luk ging due to their roles in securing an uninterrupted transmission of force within the neck and skull when techniques are executed. It is essential that the teeth are clenched to stabilize the skull so that the force will be strengthened and reinforced throughout the entire body rather than dispersed and weakened through a sagging jaw. After luk ging is established, a direction needs to be given to the issuing force. Defined as sei noi biu ging, literally the four internally-supported expulsive forces, the four characteristics are tan (吞), tou (吐), fau (浮), and cham (沉). Within this context, the internal aspect is addressed by the structurally integrated mechanics of luk ging. The issuing force assumes a directional charge derived from the compressing and releasing dynamics of the waist, core muscles, and back. Tan, literally meaning to swallow, redirects an opponent's incoming force into the ground. In essence, the practitioner grounds the energy of an attack with this action. Tou, or to spit, corresponds to an outward release of force away from the body. Typically, tan complements tou as a kinetic pair. Fau, to float, is an uprooting force that disrupts and displaces the opponent's foundation. This enables the practitioner to take advantage of the adversary's vulnerable state. On the other hand, cham, a sinking action, bears weight onto the opponent in a suppressing manner. Again, this provides the practitioner the opportunity to capitalize on the adversary's submissive state. 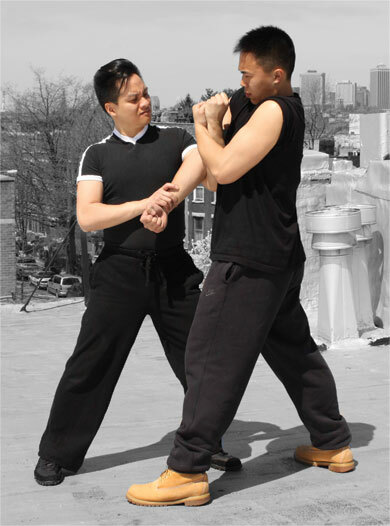 The concept of tan, tou, fau, cham is found in many Southern Chinese martial arts and their combative interpretation can range from isolated to integrated actions. Some styles translate this formula as an expression of the extremities such as hand techniques swallowing, releasing, raising, or pressuring the limbs of an opponent's attacks. Others view this concept as one arising from a holistic source based upon the principles of connected and coordinated movements reinforcing techniques. Of the various viewpoints, Pak Mei practitioners characteristically subscribe to the latter position. When techniques are executed, they employ a combination of eight actions as prescribed in the term baat ging: bin (鞭; whipping), got (割; cutting), waan (挽; pulling), jong (撞; colliding), chung (衝; charging), tan (彈; springing), sok (索; jolting), and pun (盤; revolving). Each action is either coupled with a complementary movement or executed with a reinforcing motion. Additionally, each set of extremities - the arms and legs which are supported by the interconnected zones of luk ging, maintains the capability of employing any combination of these eight actions within techniques. 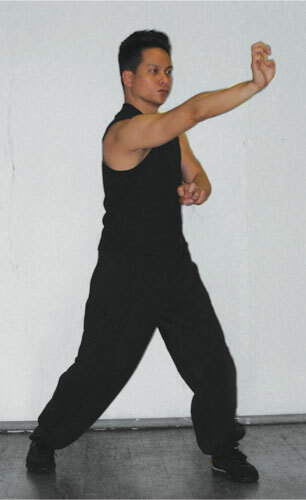 The three basic Pak Mei fighting shapes, or Saam Ying (白眉派三形 ), defines the strategic body positioning that can be used to maximize attacks against an opponent in Pak Mei Kung Fu. Flat, or bin (扁形),refers to the Pak Mei practitioner's upright torso angled in the direction of an adversary in a face-to-face encounter. 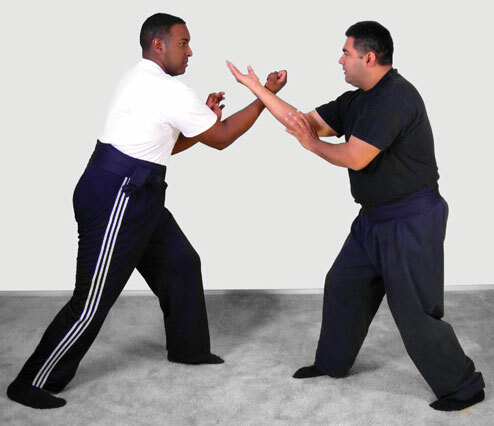 Somewhat similar to a boxer's basic stance, the flat shape minimizes the practitioner's exposure of the middle gate guard while providing optimal leverage to deflect an attack. Bok (薄形), or thin, relates to a perpendicular positioning of the practitioner's body as it faces an opponent. Rather than stand toe-to-toe against an opponent as in the flat shape, the thin shape posture confronts the adversary on a profile, or side stance. In this posture, the thin midsection of the body only exposes the flank of the body which is guarded by both the positioning and techniques of the arms. The head in the upper gate faces the opponent, but is angled and tucked to minimize direct blows to the temple and throat. Round, or yuhn (圓形), is the term used to describe the curves and arcs found particularly in the shoulder, back, and chest areas that form this upper body structure. This unique shape permits the contraction and expansion of the chest cavity combined with the sinking and rising motions of the abdominal area, respectively. In turn, these thoracic and hydraulic actions enable sei noi biu ging to execute the directional force of Pak Mei techniques. For the beginner, these foundational structures provide a framework for an effective fighting strategy. For the experienced, these concepts form the basis for more fluid and adaptable postures that are more refined in execution. 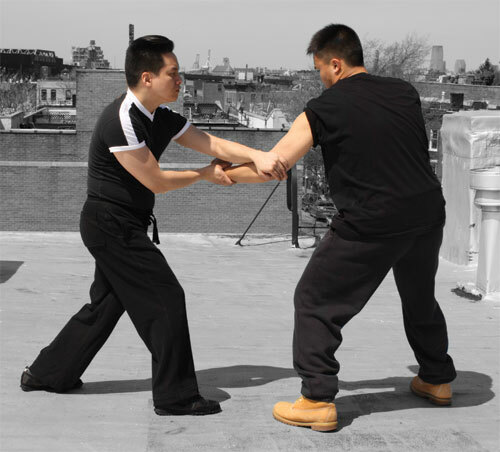 According to Master Kwong Man Fong, it is important to understand that the most effective techniques are direct and straightforward, and the simplicity or sophistication of techniques is dependent upon the circumstances in which a confrontation occurs. Deui lin (對練), or the application of Pak Mei methods with a partner, can be divided into sequential learning and realistic training. Within the context of the training of any technique, a trustworthy and competent partner is essential to the learning process. A novice practitioner initially trains simultaneous blocks and punches along with forceful kicks until the movements and mechanics are instinctive, explosive, and effective. These basic punching and kicking skills are the building blocks upon which more sophisticated techniques rest. This foundation enables the practitioner to move into the category of cooperative training where techniques are explained by the instructor while opportunities to explore with a partner are experienced in a controlled manner. This critical stage is vital to the process of not only learning, but understanding the intricacies of applications. As the practitioner advances toward the uncooperative atmosphere of sparring and spontaneous situations, a more accurate phase of training and fighting enables the practitioner to become acclimated to the unexpected exigencies that arise from an unaccommodating partner. This realistic method of practice with a renitent partner trains the practitioner to observe the practicality of techniques and to experience the continuum of technical execution that is involved in most combative situations. 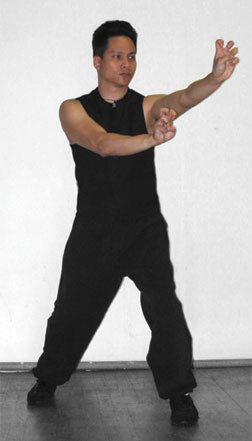 Pak Mei Kung Fu, as in nearly all Chinese martial arts, prides itself on lethal techniques that typically cannot be authentically trained due to its potentially fatal nature. Since these methods cannot be tested and replicated on a live person without the possibility of death, their intent is trained on inanimate apparatuses such as sand bags, wooden dummies, and bundled rods. In the meantime, unrehearsed sparring is essential toward contact sensibility and combative conditioning. It is important to understand that what cannot be realistically trained cannot be reliably executed contrary to the highly romanticized one-shot-kill theory ubiquitously conveyed in nearly all traditional Chinese martial legends. Precision strikes, vital area attacks, and tissue tears are dependent upon ideal conditions - ones that an actual opponent will not let materialize unless he is already incapacitated. 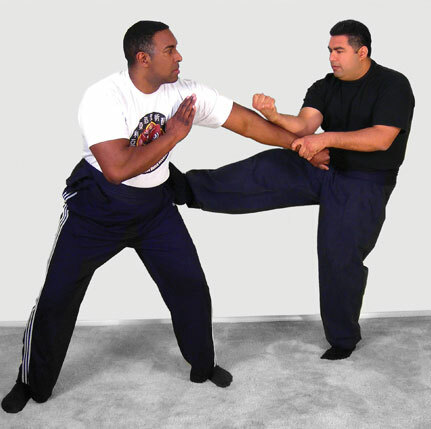 For this reason, training within a continuum of fundamental punching and kicking techniques and functional leveraging methods enables the practitioner to engage in live combat while minimizing the risks of injury or fatality. At the same time, should the need arise to intensify attacks in actual confrontations, the lethal methods can be executed seamlessly as the effectiveness of replicable and reliable techniques prime the opponent for the more extreme Pak Mei applications.